Little did I realize my comment regarding band-aid being one of the flavors in Penzance would spawn such an awesome bomb from Neil. My wife and older son began googling numbers for the nearest place with a rubber room as I laughed while pulling band-aids and iodine cream from the package of faraway origin. I can't say how much I appreciate this Neil. I did (as I mentioned to you) taste that flavor coming through which I hadn't picked up on the humble sample I had previously. I just remembered a day or two ago that I picked up something similar in a cigar. One of those Foundry doodads that come with the metal gear band had a strong iodine flavor that unlike Penzance, was more upfront and did not add to the enjoyment of the stick. I can't believe I had forgotten that experience, I may be closer to the rubber room than I thought. 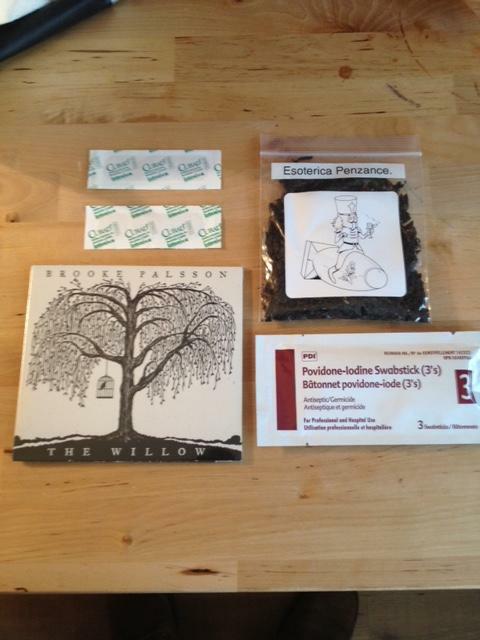 The tobacco is quite a treat and will be savored, and the Brooke Pallson CD is very good. It makes a good soundtrack for this time of year as the cold slowly loosens it's grip. Nice touch adding those band-aids! Well done guys!!! Band Aid. And people wonder about my aromatic choices! and when did you happen to taste band aids before to be able to draw on that?